Jon Husted, who is currently serving his second term as the Ohio Secretary of State and is the Republican nominee for Ohio Lieutenant Governor, spoke at the Fayette County Republican headquarters Thursday on Court Street. 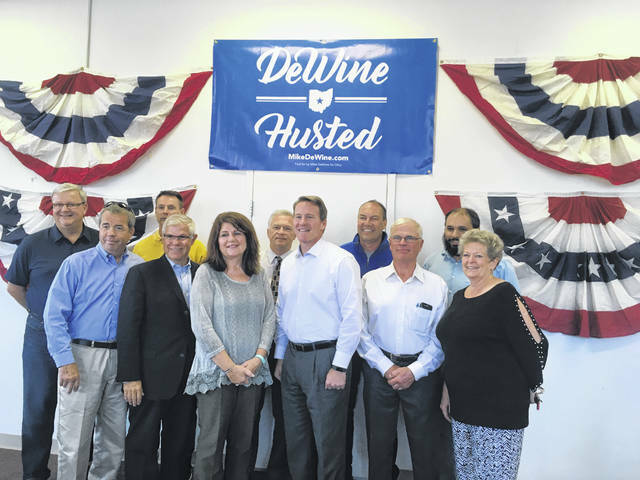 Husted, gubernatorial candidate Mike DeWine’s running mate, stressed that this general election “is an incredibly important time,” and emphasized the importance of voting and of speaking with friends and neighbors about doing so as well. Husted also focused on Issue 1, which he opposes. If passed, Issue 1 would: reclassify drug possession offenses as misdemeanor crimes, except for drug possession or trafficking offenses currently categorized as first-, second- or third-degree felonies; prohibit jail sentences for drug possession until an individual’s third offense within 24 months; allow inmates convicted of nonviolent crimes to reduce their sentences up to 25 percent for completing rehabilitative, work or educational programming; and apply cost savings from reduced prison expenses to drug treatment programs and crime victim services. Husted said he opposes Issue 1 because, among other reasons, he believes it would lead to increased drug abuse in Ohio and it would eliminate drug courts because judges would no longer be able to force individuals to seek treatment by threatening jail time if they do not. He also stressed that drug abuse is not a “victim-less crime.” In particular, he focused on the babies who are born addicted to drugs due to in-utero exposure, saying “I know of a little baby. She was born at 1.7 pounds at five months.” He said this baby spent months in the hospital where she had to undergo surgery, and she will always have problems with her vision due to her mother’s use of drugs. He also expressed concern about fentanyl in particular, due to the fact that relatively small amounts of the drug have the potency to kill thousands of people. “We need to get that off the street,” he said. Husted also said, regarding Issue 1, “We don’t need any crazy, dangerous ideas from California.” Issue 1 has attracted much interest from individuals who live out of state and some wealthy outsiders have donated to support the issue. The Democratic gubernatorial candidate, Richard Cordray, has come out in favor of Issue 1. Husted also spoke of the recent Senate hearings over the nomination of then-Judge Brett Kavanaugh to the Supreme Court. The hearings included accusations that Kavanaugh had assaulted Dr. Christine Blasey Ford while the two were in high school. Kavanaugh was sworn into the Supreme Court on Saturday and is now at work as a Justice.